Summer is an interesting time for Austinites. We indulge in more outdoor fun like grilling, boating and swimming while simultaneously seeking indoor activities to get us out of the heat and into the wonderful cool generated by our trusty air conditioners. Luckily for us, there are two activities happening about town this month to serve our many and varied foodie needs. Central Market’s Burger Revolution (June 22 – July 5). We grill pretty much year round in Austin; it’s one of the many benefits of living in Central Texas. Even so, we’re not immune to the desire for a great that summer seems to spark. To help make our summer burger adventures that much more exciting and interesting, Central Market is encouraging us to rethink the classic burger with special recipes, prices, and cooking classes. Move beyond beef patties to lamb, turkey, and salmon. Try a bagel or ciabatta roll in place of a bun. The possibilities are endless. And Central Market isn’t stopping with the food side of the equation. You can learn to pair your burgers with Bordeaux wines to really shake up your picnic or al fresco dinner. 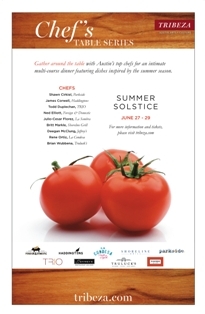 TRIBEZA Chef’s Table Series (June 27 – 29). Take a break from your own kitchen and treat yourself to a special dining experience you can’t replicate any other time of year. The TRIBEZA Chef’s Table Series will not only feature special menus featuring ingredients from the summer’s local bounty, but the chefs will join you at the dinner table to discuss the passions and perspectives. Once you’ve spent time with a chef you’ll never think about their food in the same way again. TRIBEZA has done a nice job recruiting some of Austin’s best chefs for these dinners including Todd Duplechan of TRIO, Ned Elliot of Foreign and Domestic, and Shawn Cirkiel of Parkside. Dinner prices range from $70 to $100 per person with optional wine pairings available. If you’re looking to treat for yourself or someone special this month, you can’t go wrong with these dinners. Beyond these two event series, there are several other great events on tap this month. Be sure to visit the Austin Food Lovers’ Companion Facebook page for regular updates on upcoming events. Think of color wash. Simple.